Multicolr Search Lab (or Multicolor Search) is a free website to search images by colors. It searches for images on Flickr. Unlike other image search engines, which use image URL or keywords for searching the images, this website searches by colors. 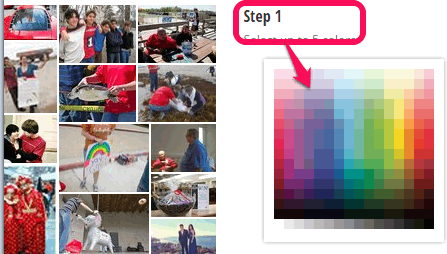 To search images by colors, select up to 5 colors on this website. This website will then search Flickr for the images that have all those colors. Pretty simple, right! This is a pretty unique website as sometimes designers and developers need images that contain specific colors. So, instead of going through tons of images manually, you can just head over to the website and see which images have all the colors that you want. And to download any image, just click on the image on this website, and it will take you to Flickr page for that image from where you can download it. Apart from selecting the colors, this image search engine also lets you enter tags to refine the search. Moreover, you can even adjust the percentage of selected colors to find images. In the above screenshot, you can see the homepage of this website where image search is performed by me by selecting 5 colors. If you are looking for some online photo storing website, then you may check these 5 free unlimited online photo storage websites. How To Search Images By Colors using This Free Website? Step 1: Select 5 colors using the color palette available on right side. Real-time search results are provided by this web app. You can view images on left side and can even change colors, whenever required. Step 2: This step is useful to set the percentage of selected colors for better result. By default, all 5 colors are set to the range of 20% for image search, but you can change the composition. Simply press, hold, and move slider divider for the required color to set the percentage. Search results will change immediately according to the composition. 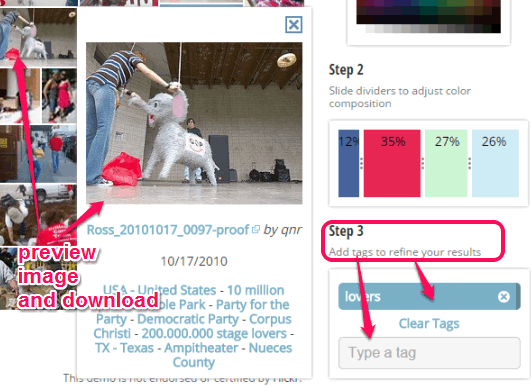 Step 3: In this step, you can make search results more accurate by adding tags for the image search results. For example, if you are looking for nature images in specific colors, then start by selecting the colors and then specify the tag as “nature”, and you will have images that match that criteria. You can actually use multiple tags (like, mountains, rivers, etc.). Once you are done with above steps, the images that match your search criteria will be in front of you. You can move to next pages to check more images. Once you find an image you like, click on its thumbnail to preview it. Finally, you can tap on the image to download it from Flickr. Multicolr Search Lab comes with very unique idea and provides interesting images based on colors. Feature to add tags and set percentage of colors makes it more helpful to refine the search results. So, if you are looking for a way to find images by colors, this has to be your starting point. 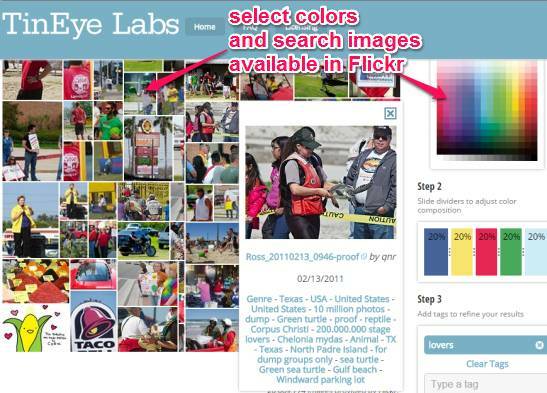 Try Multicolor Search Lab free.